IDM Optimizer is a free utility that upgrades your download speed with Internet Download Manager. With this software you can download every file from the Internet up to 5 times quicker. Moreover, optimizer has super user friendly interface one simple button and no special time consuming adjustments. Boost a speed of downloads, resume it after troubles with network and all this with free IDM Optimizer for Internet Download Manager! The purpose of this lightweight application is to help you tweak Internet Download Manager, in order to optimize the download process and get the data on your computer much faster. Designed with ease of use in mind, IDM Optimizer features a simple and clean interface that only comprises three buttons. 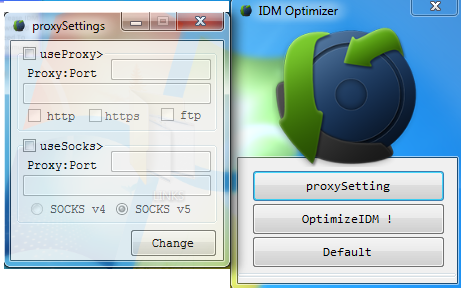 One is for accessing the proxy settings, the second starts the optimization process and the third restores the default settings of the application.All in all, IDM Optimizer promises to enhance IDM’s ability to increase the download speed by modifying its settings, which might help with downloading large files using Internet Download Manager. Not a lot of effort is required on your behalf, letting you quickly accommodate and have your download speed enhanced in the blink of an eye.